Herbs like dill are popularly used in cooking as these lend a distinct taste to your food. Dill’s pleasant flavor and taste makes it a popular herb among people. Dill can grow up to 4 feet in height and looks very beautiful. It produces stunning flowers that are yellow in color. If you want to know how to grow dill in pots and containers, we can surely help you out! We will cover a few basic and important steps that will make growing dill easy at home. Look below and get started! The container chosen should have at least 12 inches depth as Dill is a plant that grows very tall. So, in order to prevent it from bending and falling over, choose a deep pot. Both the potting soil mix and the gravel are required for good drainage. Buy your dill seeds from a nursery that sells reliable varieties. Filling the container with potting soil mix forms the first step in this post that’s speaking on how to grow dill in pots. You have to take a deep pot, measuring approximately 12 inches in depth and having a diameter of 8 to 12 inches. This is because a dill plant grows very tall, and if you plant it in a shallow pot, chances are that the plant will bend down and fall. A deep container enables proper growth of a dill plant. However, refrain from using a larger pot as the plant will likely focus all its energy in growing roots, whereas, all the focus should be on producing more foliage. After you have chosen the appropriate pot for growing your dill, its time for filling it up with gravel and potting soil mix. The gravel must fill up at least 2 inches of the container. This is put in order to facilitate proper drainage. Now, fill the remainder of the pot with potting soil mix, preferably organic. The mix selected must be well draining. You can also use soil less potting mix if you want to fasten the process of germination. Once you have filled the pot with potting mix and gravel, its time for sprinkling over the dill seeds all over it. Also, make sure to put a light covering of potting soil over the seeds. It should be at least 1/4 inches of soil covering over the seeds. When planting dill, its mandatory to see to it that the potting soil is moist and in no way dry. Spring and summer are the best time to plant dill. Showing sunlight is of prime importance in growing any plant, and dill is no exception. Once you have planted the seeds in the soil, its time for showing sunlight to them. Therefore, place your pot at a location that receives good amount of sunlight like a balcony or windowsill. Show the pot at least six hours of sunlight regularly if you want the dill seeds to sprout within 14 days. Make sure that the plant is placed in a spot where temperature fluctuates between 60 and 75 degrees. Watering the dill plant is also very important. After the dill seeds are planted and shown sunlight, its time for treating them with water. This will ensure that your dill seeds are moisturized and do not dry up. Germination is a critical time when you must water the seeds. After you have watered, the seeds will start to sprout in the next seven days. Once the dill seedlings have sprouted, you will have to trim them. It will take about 14 days to see the first sign of a seedling emerging from the soil. Let the seedlings grow a bit taller when you can start trimming them. The rule here is to thin the weakest seedlings so that only the healthiest ones survive and continue to propagate. Keep one seedling per pot as one dill plant can grow to 6 inches in height. After thinning the dill plants, its time to water them again. Make sure that the top most layer of soil is not dry. Only if you feel it appearing dry, should you water. If you have placed your dill plant inside, then water it twice in a week. However, for outdoor pots, you may have to water regularly. Fertilizing is as important to dill as for any other plant. For a dill plant to grow optimally, you have to fertilize once every four weeks. Choose a fertilizer that is soluble. Too much fertilization may damage the plant and prevent it from producing tasty foliage. When fertilizing, make sure to spray only a diluted form of it over the dill plant. Leaves usually get ready for harvest within two months from the date of planting the dill. The general rule is that you can start harvesting when you see at least five leaves on a dill plant. The best time to harvest is evening or a time when the temperature is cooler. There are basically two ways to harvest dill – pinching and cutting. The leaves can either be pinched off using fingers, or else, use scissors to cut them away. Its not merely the dill leaves that can be harvested; the flowers, too can be plucked away so as to collect the seeds. After the harvest of dill leaves and flower heads is done, its time for you to store them for later use. You can store the dill leaves in a plastic bag after you wrap these in a damp paper towel. In case you want to freeze the dill, you have to first wash the leaves properly so as to eliminate any kind of dirt or grime. Then, trim and chop the leaves. Dry these completely, and then store these in air tight freezer bags or jars. You can also store the chopped dill in ice cube trays and place inside the fridge. Dill can be grown from seeds or from cuttings as well. If you wish to know as to how to grow dill from cuttings, here are a few important tips that you all must read. Dill can be grown from stemmed cuttings, for that choose the healthiest looking stems. If the weather conditions are not cool enough, put these stems in water for rooting. Wait for at least a week for the roots to grow. Afterwards, place the stem along with its roots in a pot and follow the same steps as mentioned like showing sunlight, watering, fertilizing and harvesting. You must harvest the dill when you spot 4 to 5 clusters of healthy foliage on the plant. It usually starts to grow healthy after 4 weeks of planting. Always choose the cool time of the day to harvest dill. You can harvest both kinds of dill leaves – dark and light. The dark leaves appear before flowers start to bloom on the plant. Young or light colored dill leaves too are loved by people who think they taste better when young. When harvesting, use your fingers or scissors to pluck or cut away the stems. Also, when harvesting, make sure to leave at least half of the leaves on the plant so as to enable it to keep producing. Most people pickle dill to eat it along with their food because pickled dill tastes very flavorful. When pickling, choose the whole stalks and wait till the dill plant reaches maturity. Though, you can store dill leaves and flowers for later use, however, the fresher they are harvested, the better they taste when added to foods. Therefore, harvest immediately before you start cooking. Dill leaves can be dried by hanging them upside down in a room that is dry and is well ventilated. Its not just dill leaves that can be stored and preserved. The flowers and seeds too can be harvested and preserved for later use in cooking. You can also replant using these harvested dill seeds and flowers. Dill is an amazing herb which we all love to add to our dishes as it is flavorful and delicious. Growing dill doesn’t need you to study rocket science. All you need is a little bit of help to get going. 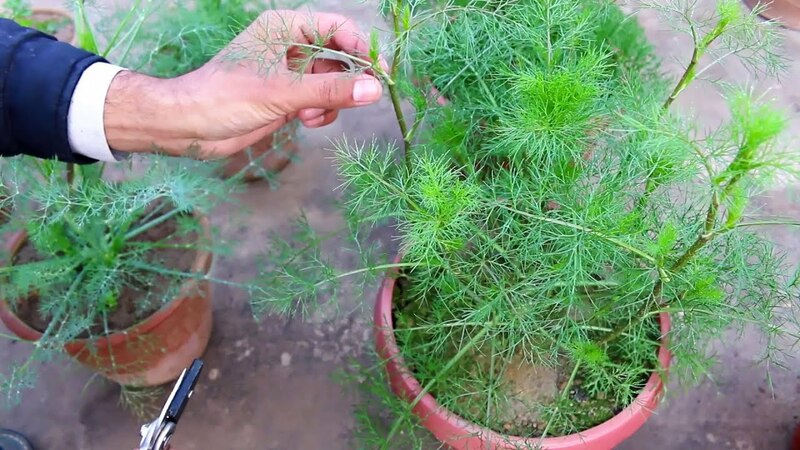 If you really want it to grow in your home, then do read these easy steps on how to grow dill in pots. Believe us, you will succeed!